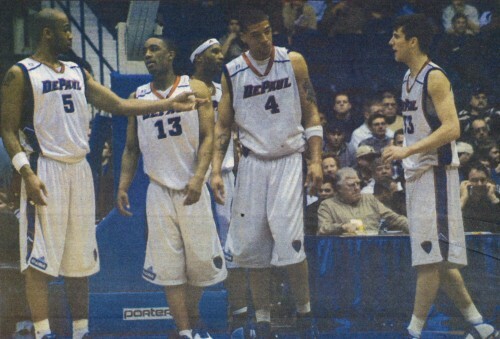 The 2003-2004 team (above) was the last DePaul team to make the NCAA tournament, where they won their first round game against Dayton in a 70-68 double overtime win. 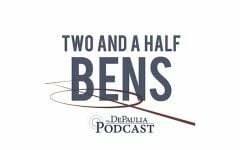 The following is a condensed oral history about the last DePaul team to make the NCAA tournament, also coached by Dave Leitao. The DePaulia interviewed players, coaches and close observers from that year. Click the banner to the side for the full multimedia piece. After a successful regular season campaign where the Blue Demons finished in a five-way tie for first place in Conference USA, DePaul lost to rival Cincinnati 55-50 in the conference tournament final, meaning they left their NCAA tournament chances to a selection committee. While they would make it in, they would be without Levar Seals, a key defender, who was suspended automatically for getting ejected in the game prior. The Blue Demons would go on to draw Dayton. Dave Leitao, head coach: (Seals) got thrown out for throwing a punch to one of Cincinnati’s players, Tony Bobbitt. It wasn’t much of a punch, but at the same point in time, it got him removed from the game. Steve Newhouse, journalist: If you could see the look on LeVar’s face when he came back to the bench. He was astonished. He couldn’t believe the call from that, being ejected from the game. 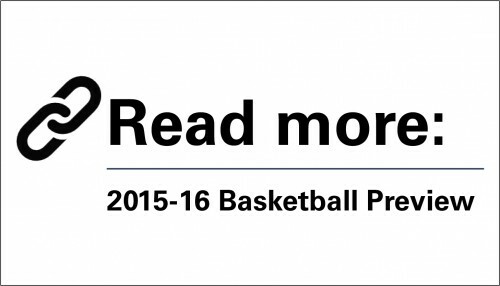 Jean Lenti Ponsetto, athletic director: I asked for a review of the technical foul (LeVar) had been given. I spent a lot of time with the NCAA national coordinator of officials at that time, trying to better understand why we couldn’t reverse a wrong call that would take this young man out of his NCAA tournament game that we hadn’t been to in a couple of years. He was a senior and thought that would be a tough way if that was the end of his career. Quemont Greer, forward: Going into that game, knowing LeVar wouldn’t be able to play, he was one of our better defenders. We had one of our better defenders out. We took that approach we were going to play for him. Greer: There was a time where we probably should have lost that game. I knew it was a teeter-toter back and forth type of game. Andre Brown, forward: It didn’t start to become a game until the (second half). It was tough. 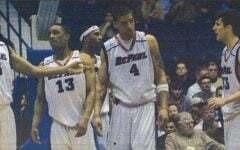 I remember Dayton had two big guys who I thought I was much better than. But I think we had Quemont playing the four, but he’s kind of undersized. But he’s tough. I feel like we held our own. Gene Cross, assistant: Going into double overtime, I think we were in a never say die mentality right there. We had fought so hard in order to make it to that point. Sammy Mejia, point guard: I remember him getting into a groove. Me and Drake had a great relationship, when he would get in a groove I’d find him in time outs. I’d say move around, I’ll find you. He was such a great shooter, when he gets into a rhythm it’s hard to stop him. Marlon Brumfield, forward: We all knew that Drake was the best shooter on the team, if not the conference itself. I knew, man, if I could get him a nice, good screen and if he had the look, he was going to knock it down. 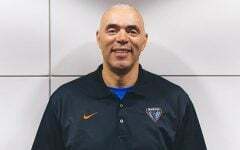 Leitao: He carried a pride about himself and aggression when it came to basketball and between the lines on the court, he wasn’t backing down from no opportunity and from no one in that opportunity. He proved it that day. 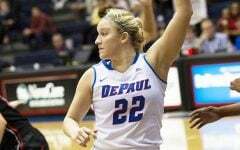 DePaul won its first tournament game since 1989, defeating Dayton 70-68 in double overtime.